Take advantage of your surroundings! Hey team! The weather is getting nice outside, so this month I would like to take some time to remind everyone of how beautiful Calgary and it’s surrounding areas truly are and encourage you to take full advantage of the many outdoor activities in and around the city. Calgary is filled with beautiful parks and trails so add a little mix to your workout routine, whether it’s going out for a walk through places like Fish Creek Park or a bike ride through your community of choice. I will also encourage you all to add small exercises while out doing these types of activities like using a park bench to do things like step ups, push ups and dips. Just adding 3 sets of these simple exercises to a walk will help build strength, boost your metabolism and help to lower your resting heart rate. Not only that but being outside in the sun is a great source of vitamin D which will help boost your energy levels! Now don’t forget that we are all lucky enough to have some of the best hiking and biking trails in the country to the west of the city in places like Kananaskis Provincial Park and Banff National Park, all within an hour and a half drive from the city. So, get out and explore as much as you possibly can of our beautiful country and surroundings. You never know what you might discover on these trips, like the views you might see or the wildlife you may bump into! We are truly blessed to have all of these actives and experiences around us. After a good hike or bike ride, remember the doors are always open at the gym so join us for an awesome Muay Thai or BJJ class to complete your fitness goals! We love being a part of your journey! How consistently do you train? For most of us, our goal is to get in 3-4 times a week of physical activity, and for the most part this is not too difficult - especially when we are new to the sport and have just found something that we really enjoy! But what happens when “life” gets in the way? Small injuries, work, family commitments, holidays etc. Now we may only be able to get into the gym maybe once or twice a week, and even though we still love to train and exercise, we sometimes start to look at training once or twice a week in a negative light. “Ugh, I will only get to train once this week, is it really worth it to train at all?”. It is absolutely worth it! There are so many beneficial aspects that exercise brings into your life. The reason you started training in the beginning was for all of those reasons that you already are familiar with. We may not all train for the exact same reasons, but we all entered into this with our own goals in mind. A simple trick that we use to make sure that we stay motivated to go to the gym – even once a week if that’s all we can manage – is to turn that negative thought into a positive one. “Yes! I get to go train and see my friends at Elite!”, or “I know I’m going to feel awesome after this training session tonight!”. Remember that thinking positively throughout the day will in turn create positive energy for you, followed by positive outcomes. In conclusion, if we challenge ourselves to always associate training with a positive thought or notion, it will undoubtedly help to make you a more stress- free and productive individual in all aspects of life! Try to always let your gloves completely air dry after each training session – bacteria needs moisture in order to live and grow. Remove them from your gym bag when you get home and set them out in a spot where they can get plenty of air. Don’t re-use your hand wraps – if you do this and your wraps are still damp or wet from your last training session, you will just be reintroducing a whole new colony of bacteria into your gloves. Using clean and dry hand wraps is essential for controlling the gross factor of your Boxing Gloves. Try an anti-bacterial solution if your gloves are already stinky – just be careful when choosing your solution, you would not want some of the harmful ingredients that are included in some cleaners to transfer to your hands then your face, etc. To make your own natural cleansing solution, mix ½ cup of white vinegar, 1 cup of water and five drops of tea tree or lavender oil and use in a spray bottle. 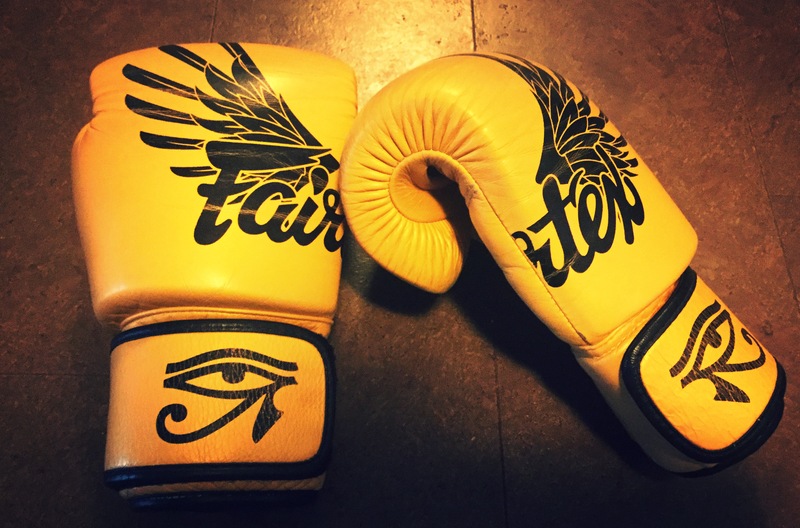 Clean Boxing Gloves make for a more pleasant training experience and less germs floating around the gym, and you won’t end up with stinky glove hands after your training session either! Exercise has now been studied quite substantially in the literature in it’s effects on promoting positive mental health outcomes. It has been recorded that aerobic exercise 2-3X a week of at least 21 minutes in duration yields strong benefits toward both psychological and physiological health parameters. Reducing anxiety, depression, anger, stress and cynical distrust, all while improving self esteem and cognitive functioning, make exercise one of the most inexpensive and valuable assets in our modern world. Regular exercise has also been found to improve quality of life in those suffering from mental illness, and improve those working though eating disorders. There is a call to action for our mental health providers to start to integrate exercise in our current interventions, where a neglect of physical activity may be one of the key missing pieces to our current therapies. Not only are the immediate effects of exercising relaxing, but it has been shown that exercise can positively change the way a person responds to stressful situations. Exercise also aids in better coherence, and leads to stronger feelings of social integration, developing community, friendships and a feeling of self empowerment. 1) Hold the pads close to your body and encourage your partner to start their techniques lightly, gaining in power with greater familiarity with one another. Keeping your pads close to your body will keep your striker friend from throwing wild and unfruitful techniques, preparing them better for the real world. 2) Taking a bit of the sting away from the techniques by pushing into them ever so slightly. Similar to “Patty Cake”, you want to push into the punches, kicks, knees and elbows just a bit to aid in timing, and better technique. Not too much though, pushing hard into punches and kicks will stuff them, and have the opposite effect of better technique. 3) If you or your partner is having difficulty executing a particularly long sequence of moves, break them down into smaller bite-sized chunks, or stick with only one part to the sequence until it becomes fluid and easier. Remember that learning to throw one solid kick will be more effective than learning to throw 50 poor techniques. 4) Be vocal. Encouragement and communication are key to a happier relationship between fellow martial artists, and plus, you’ll get more done with a bit of vocalization. 5) Maintain proper distance between you and your partner. There is a different amount of space needed for punches, knees, kicks or elbows, and when techniques include marching or passing, keeping the ideal distance between you and your partner will lead to the best technical improvements. Remember that whether you are striking, or holding the pads, learning to work with one another will always turn out for the better. That betterment may be in the form of improved techniques and relationship amongst one another as friends and martial artists. Having the opportunity to grapple and roll with your fellow martial artists is a privilege with an unspoken agreement between parties to maintain proper hygiene. This sport is all about the up-close-and-personal, where the last thing you are hoping for, is to have your face smothered into an unwashed Gi. The skin to skin contact can provoke fungal infections like ringworm to work their way around your group of friends, and the best way to eliminate this problem is to maintain good hygiene. 1) Wash your Gi every time you use it. Even lightly using your Gi should warrant a trip to the washing machine. If you need another Gi, with frequent rolling, or infrequent access to a washer/dryer, then purchase another Gi. 2) Use Tea Tree Oil in your wash / and or dry cycles. A couple drops on a dryer ball / wool ball or clean towel, thrown in the dry cycle, will de-odorize and disinfect your Gi. I tend to put a couple drops on the collar of my Gi in the wash cycle as well as the dry cycle, just note, that when using tea tree oil in the wash cycle, oil spots may occur. Oil spots do not occur in the dry cycle when placing the oil on a towel or dryer ball. 3) ½ cup of white vinegar in the wash cycle can help remove odours, as well as preserve the colors of your fabrics. For very smelly Gi’s, soak them in a bath with 1 cup of white vinegar, and wash as normal. 4) ¼ cup of baking soda to the wash cycle will also help with odours and is often what I add to loads of white Gi’s. This will help maintain the white color and give the Gi a pleasant new crispness. 5) Wash Gi’s in cold water to prevent shrinking, and leave out the dryer with Hang Drying for Gi’s that fit perfectly. 6) Remember to wipe your feet and be sure to keep those little pink piggies clean. This sport uses fingers, feet and toes like no other, so for the respect of your fellow friends, keep clean. 7) Finally, be sure to trim all nails (toes included), as no one would like scratch marks, or a nail to the eye. Martial arts strengthens. Strength comes from the more visually obvious reasons of physically getting stronger and for self defence, but this sport has a number of less obvious, equally important effects. These effects come in the form of mental toughness, resiliency in the face of adversity, and community development. Self-Efficacy is a term coined by the Psychologist Albert Bandura in the 1970’s. This term is all about belief. Belief in oneself, one’s abilities, and belief in others. It’s a concept of self empowerment and has proven through many publications to date, that belief impacts every facet of life. The stronger you believe in your abilities, the more likely you are to adopt and stick with a program, whether that program be for weight loss, getting more active, or learning a new skill. 1)Try writing down your goals. These could be big goals like weight loss or perhaps competition goals. Then try thinking of all the steps needed to get to that ultimate goal. These smaller steps are crucial in the likelihood you’ll end up achieving the big picture. Focus on mastery goals for the smaller steps. These smaller goals can be based on how many techniques you can learn, or how many classes per week you are wanting to attend, or what competitions you are looking to get involved in. Celebrate the small steps, make note when you achieve even the smallest of steps, and remind yourself of how much closer you to each stage you are on the way to the ultimate goals. 2)Try and get active in the community. Go out to competition events and support your athletes, join the group on social media, and maybe make it a goal to introduce yourself to one new person a day at the studio. When you get involved and build community, you improve the belief you have in others and them in you. This belief-reciprocity is another great way to build confidence. 3)Reframe difficult situations into positive manageable ones. Getting active or competing may not be easy. You will face moments where you feel tired, sweaty or maybe more out of shape that you’d like to be. Learn to make small changes in the way you perceive these uncomfortable situations. When you’re tired and out of breath, instead of slumping over to try and regain your breath, stand tall, open your chest and take deep breaths. You’ll find that this simple action will change your perception of the physical stress and make you look and feel like a winner. Anton, S. D., Perri, M. G., Riley, J., Kanasky, W. F., Rodrigue, J. R., Sears, S. F., & Martin, A. D. (2005). Differential Predictors of Adherence in Exercise Programs with Moderate versus Higher Levels of Intensity and Frequency. Journal of Sport and Exercise Psychology, 27(2), 171-187. Efficacy and Health-Related Quality of Life. Journal of Physical Activity and Health, 10(5), 676-689. Middelkamp, J., Van Rooijen, R., Wolfhagen, P., & Steenbergen, B. (2016, June 01). The Effects of Two Self-Regulation Interventions to Increase Self-Efficacy and Group Exercise Behavior in Fitness Clubs. Journal of Sports Science and Medicine, 15, 358-364. Saville, P. D., Bray, S. R., Ginis, K. A., Cairney, J., Marinoff-Shupe, D., & Pettit, A. (2014). Sources of Self-Efficacy and Coach/Instructor Behaviors Underlying Relation-Inferred Self-Efficacy (RISE) in Recreational Youth Sport. Journal of Sport and Exercise Psychology, 36(2), 146-156. Su, X., Xiang, P., Mcbride, R. E., Liu, J., & Thornton, M. A. (2016). At-Risk Boys’ Social Self-Efficacy and Physical Activity Self-Efficacy in a Summer Sports Camp. Journal of Teaching in Physical Education, 35(2), 159-168. Umstattd, M. R., & Hallam, J. (2007). Older Adults’ Exercise Behavior: Roles of Selected Constructs of Social-Cognitive Theory. Journal of Aging and Physical Activity, 15(2), 206-218. Weinberg, R. S., & Gould, D. (2015). Foundations of sport and exercise psychology. Champaign, IL: Human Kinetics. Our grandparents knew how to make a delicious and nutritious broth. Instead of synthetic flavours that are found in a cube or package, they would simmer leftover bones in water for 24 hours and then use the broth for soup stock. You’ll notice the bones after simmering will leave the broth as basically mush, hallowed out of all the marrow, and when cooled, the liquid will gel. This broth is filled with everything your body needs for tendon / ligament, soft or hard tissue repair and is an excellent addition to the hard conditioning of a fight sport. Nature knows best, where this broth is filled with all Collagen, Hyaluronic Acid, Chondroitin, Amino Acids, minerals and growth factors for repair and recovery. Everything you usually look for in a recovery formula is found in bone broth, and there is no better way to get all of these wonderful things in one place. Plus, Bone Broth is seriously tasty, where the supplement you buy at the store is literally a pill or powder…yum! Remember to buy organic bones, as you will see the difference when you make your broth compared to conventional animal bones. The scum that rises to the surface is much thicker and might have a funny smell. I suggest you start with organic poultry bones as it is exceptionally easy and gives excellent flavour. I like to include a few superfoods in my morning broth. I will add salt, black pepper, lemon and ginger. Or I love to enjoy a medicinal mushroom blend with salt and goji berries (Try Cordyceps for Athletic Performance). I If I am feeling under the weather, I will slice in some raw garlic and ginger with some salt as well. Tea Tree Oil aka Melaleuca is an essential oil with a wide variety of use and benefits. With over 350 studies on its effects ranging from acne, earaches, bad breath, respiratory infections, staph, MRSA, and fungal infections it is a natural health product that is a definite must have for any martial artist. Below are 3 of the best ways to use Tea Tree Oil for the Modern Warrior. 1. One of the best ways to freshen your laundry and kill all mould/fungus on your Gi’s/Workout Wear is to add this oil to your dry cycles. Take a thick dry (clean) towel or fuzzy dryer balls and drop 5-10 drops of Tea Tree Oil and throw it in with the wet clothes during the dry cycle of your laundry. The dry towel will help wick away moisture and cut your dry time by a significant amount, and the Tea Tree Oil will freshen and disinfect all your workout wear. This is a very effective way to prevent ring worm, staph or any other contact related infections that might arise from a fight gym. 2. You can also add 10-20 drops of Tea Tree Oil to your favourite Shampoo or body wash to get these powerful anti-bacterial/ anti-fungal effects in your shower. This essential oil is great for not only disinfecting, but also treating things like head lice, acne, and dry/itchy scalp. 3. Use 10 drops in your gloves to help remove odour and disinfect. There is a study on using tea tree oil for dry cuticles, so no stink and better skin, thats a plus. You can buy Tea Tree Oil at almost any pharmacy or health food store. I suggest an organic variety if you are planning on using it in your shampoo or body wash, non-organic would be fine for your workout wear and gloves. We at Elite believe that the foundation to a healthy and happy life are based on developing the individual as a whole and considering quality Diet and Lifestyle choices. Our motto is to Live By Example, where we greet each day by asking ourselves what we can do to change our lives for the better and lead the way for others to follow. Did you know that over 70% of North Americans are deficient in Magnesium? This simple, yet overlooked mineral has over 325 distinct enzymatic processes and has far reaching health benefits when in adequate body supply. Symptoms of deficiency can be diffuse but more commonly we see muscle twitches, cramping and spasms. In clinical settings low magnesium often is accompanying arrythmias, cardiovascular and metabolic problems. In sport and physical activity, individuals need 10-20% more magnesium than the average person and even a marginal magnesium deficiency will impair exercise performance and amplify the negative consequences of a strenuous exercise. Magnesium is required for the synthesis of fat, protein and nucleic acids, it also has a large role in ATP energy production by the cell, neurological activity, muscular contraction, and supports healthy cardiac and bone metabolism. Interestingly, many studies are now looking at the effects of magnesium deficiency and its parameters for diabetes type 2 disease prevention and management. We see magnesium deficiency runs alongside many metabolic syndromes and depression, and adequate levels of magnesium can better HDL cholesterol levels, help with overall triglyceride levels a aid in a healthy waist circumference, better body fat percentage and body mass index. Magnesium is one of the most simple, and inexpensive supplements an active person can invest in, for better recovery after workouts, and to prevent many injuries. If you drink bubbly drinks or alcoholic beverages once in a while, consume caffeine, enjoy sweets on occasion, currently taking any pharmaceutical drug or calcium supplement, if you have a lot of stress in your life, have trouble sleeping or have muscle aches, pains or cramps, you should consider taking a magnesium supplement. My favourite magnesium supplements are in liquid or are biglycinate forms for best absorption, and I find most individuals need around 400mg or more a day, especially if they are active.